JP - Hello! My name is Jen Parrish, a new member of Boston Handmade. 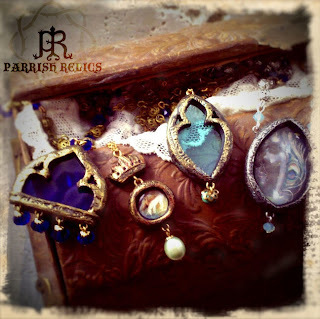 I make jewelry that is inspired by Nature, Gothic Architecture, the Pre-Raphaelites, Myth & Medievally things! BH- How long have you been doing your artwork/craft? JP - I grew up here in the Boston area, learned a few tricks at the School of the Museum of Fine Arts. Have been making jewelry for nearly 25 years ~very grateful to be constantly inspired and for my customers that keep me employed ~ doing what I so love to do. BH - Please describe your creative process (how, when, materials, etc). 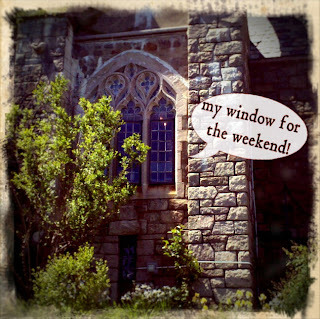 JP - My work usually begins with either a tiny image found in my vast collection of recycled magazines and catalogs or a piece of Stained Glass. I hand-cut and grind shapes that become little shrines to the original image or pay tribute to the beautiful colors and textures of the glass. The frame is created out of polymer clay, tiny tools are used to embed patterns and finally they are fired and painted to match the vintage metal findings or beadwork I choose to compliment the pendant. BH - What accomplishment are you most proud of in your work? BH - Why should people buy handmade? JP - There is nothing like purchasing something that was hand made by a person who put their creative passion into an object ~ One of a kind can be so much more fulfilling than owning a product created by machines and one of many exactly like it. Also of course to support artists and craftspeople that are trying to make it in a world that makes it pretty difficult to be self-employed sometimes! BH - How long have you been involved with Etsy and what have your experiences been? JP - It’s been a great experience selling on Etsy for the past two years. I think it has many great features and makes selling online very simple ~ sadly there are many resellers joining recently for quick money and it is getting a bit harder for people to find things that are truly hand made. Other than that, I think it is a great way to get your work out there and find some beautiful things made by people all over the world! BH - What’s your favorite way to spend a Sunday morning? JP - Reading the paper with my other half, surrounded by our three adorable cats and our feisty black lab mix that we just rescued last year. Followed by a walk in the local conservation land to work off breakfast, but mainly just to enjoy being out in nature and away from distractions. BH - Where do you see yourself in 5 years with your art ? JP - I have really enjoyed working with museums~ creating jewelry for their gift shops to coincide with upcoming exhibitions. In the past I have worked closely with the amazing Isabella Stewart Gardner Museum in Boston and I hope to continue once they open the new shop in 2012! (It is my absolute favorite place on earth, Isabella is one of my heroes.) The British Museum in London asked me to work with them on two inspiring collections so far, and I hope for many more in the future. So happy where I am now, so just more of the same would be perfect! Love being inspired by other handmade artists, thank you for sharing.